Capitol 11570. 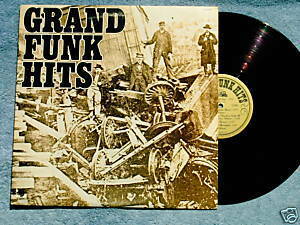 Grand Funk Hits 1976 reprint LP includes We're An American Band, Loco-Motion, Shinin' On, Sally, Take Me, To Get Back In. Songs produced by Grand Funk Railroad, Todd Rundgren, and Jimmy Jenner. Glossy photo-composite taken by Lynn Goldsmith. Cover design by Peter Corriston, Migel Sanchez, and Keith Sheridan. Vinyl is excellent; cover with photos is VG with minor corner wear and some ring wear.